Alright, so I've put on record before that subjectively, TeXtreme is so far the nicest playing material of the millennium. Well done Prince! Also, I felt the last couple generations of Prince's lineup were well thought out - nice specs, good range of racquets. Personally I've just been missing a replacement for the somewhat hefty but friendly Speedport Tour that I've played for a few years. The racquets in the current Tour series are all a bit too light for that (see e.g. my review of the heaviest Tour 95). 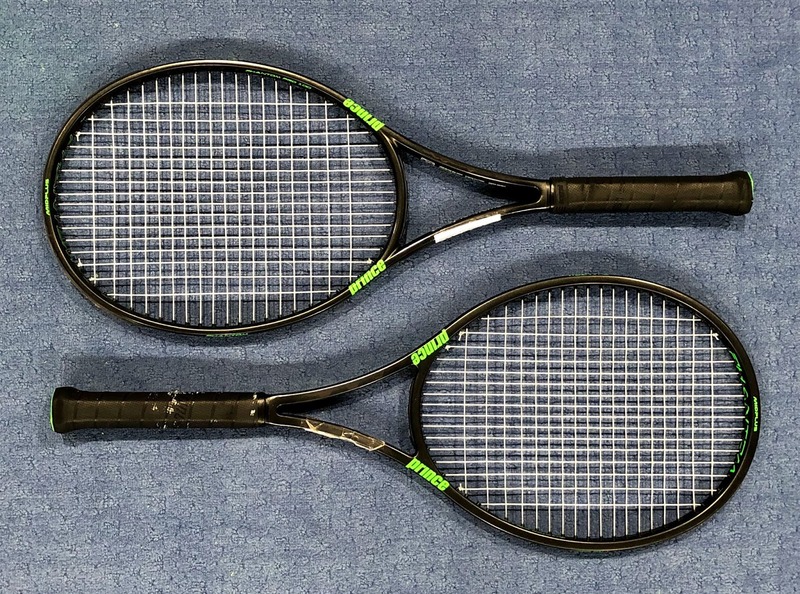 While the Tour racquets already addressed the - what would you call it - maybe "classic competitive player" market, the Phantoms took a step further by offering even more a) of a classic design (at least at first sight), b) plusher feel. So how did that line turn out then? 1) Phantom (310g, 310mm unstrung) - friendly playing, but relatively low power ceiling. The swallowing effect of the relatively light, thin, flexy beam gets a multiplier with the big Speedport grommets. (Put a loosely strung Cyclone Tour in there and the ball will probably just drop off the racquet after impact... :P) I had enjoyed these wide grommets for a while in my Speedport Tours, but ended up replacing them with traditional grommets for more power and a more direct response. This Phantom could be for you though if you're after comfort first - coming back after injury could be one scenario. Think it would be a good coaching stick as well. 2) Phantom Pro (305, 315) - slight difference in spec, but almost the Phantom with normal grommets. Still very plush. If you're looking to compete, attempt to rip a winner here and there, and are looking for more precision, this might be the better buy of the two. 3) Phantom Pro 100P (315, 315) - specs and the boxy design are even more of a nod towards a traditional player stick, with a tad more weight and a more head light balance compared to the other two. I had expected to like this one best, but somehow the Pro felt a bit better. The Pro was also nicer to touch for the supporting (!) hand. 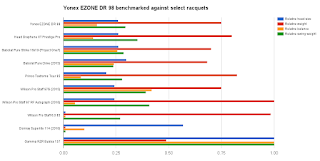 Players who are missing "the good old frames", or those who are curious to try something other than a Babolat power racquet, would likely enjoy a demo. Even just as an experience, and/or for comparison. Overall, all Phantom 100s are very nice racquets, of which any come with the potential to help most folks play better AND improve their craft (e.g. play more creatively, or generate power by hitting all out but doing so cleanly). My latest 2 demos, the Pro and the 100P, were both relatively far off in terms of weight. The 100P stood out by being 9 grams too light. Even though I don't have access to a representative sample to determine whether Prince has lowered its manufacturing bar, IMO that's already way out of bounds. After finding what e.g. Wilson's seemingly +/- 5 tolerance can do to a racquet, I'd say you want to be as close to what's printed on the frame as possible. When testing the racquets I tried to factor this in - and yes I think even with almost 10 grams more you won't end up producing a heavy ball with the Phantoms. The upside is that they're all so easy to play, they can get away with being off-spec much easier than most other racquets that come to mind. The demos came from Tennis Warehouse Europe. Though I'm obviously thankful that they're offering the program, they currently seem to run it as if they don't care about the racquets (and the folks trying them). Apart from not picking representative (i.e. true-to-spec) demos in the first place, the frames were simply tossed in the box, no overgrips provided, base grips were quite worn out, one racquet came with a rubber band and the other didn't, no dampeners included, sloppy string jobs (very different tension on very similar racquets, strings not straightened, cutoffs long, uneven, and sharp), and their own tags not affixed well. That doesn't leave much positive to say, unfortunately! Classic unstrung weight / balance combo of 310 grams / 310 mm. Otherwise harmonic package of head size, string pattern, and frame width (though the max part @ 24 mm starts to get a bit thick for a player's stick). Note the extra ~0.4 cm in length compared to the standard 68.58 cm. Not a flimsy racquet, nicely weighted and pretty stable. Frame is quite powerful. String bed is on the denser side, but still produced OK spin. Enjoyed the extra bit of length. Had a little bit of a plank-like feel similar to the Wilson SixOne's, though obviously not as hefty. Little surprised about that given the pretty whippy specs. 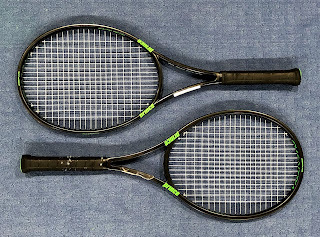 The Yonex Tour F 97 specs are almost identical, however that racquet zips through the air noticeably faster, but is less powerful and has a denser string bed. 2018 update: the new version, EZONE 98, has become a tad lighter (5 grams) and a tad less headlight (5 mm). When I tried it, it felt less planky, a bit more whippy, and more comfortable. 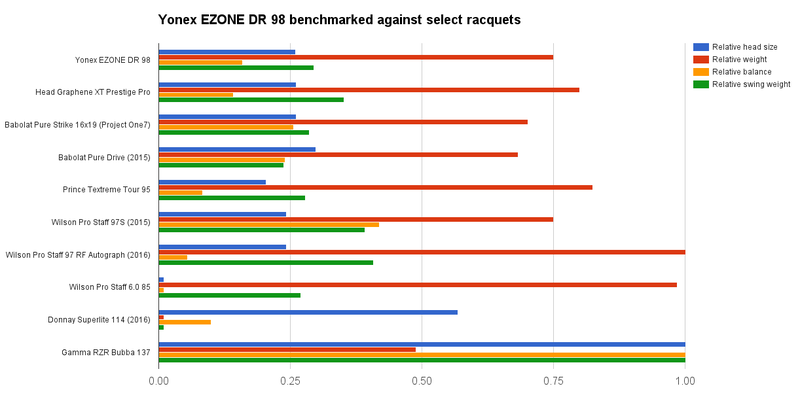 While the DR98 nicely bordered on being a player's racquet (maybe except for the 24 mm part of the frame), the EZONE I played moved another step away from that, most of all because it felt less stable. So between the 2, it depends on what you're looking for. Player type: Good modern all-court racquet, probably geared towards aggressive baseliners. Should work well for both long or short swings. String: Would probably put a control oriented, grippy poly in there, strung at around 24 kgs / 52 lbs. Maybe something like the Tour Bite or Black Code 4S. Hybrid should work well too, would put poly in the mains - a) for spin, and b) since the frame is already quite powerful. Really nice racquet that'll work for a lot of players, subjectively one of the 5 most interesting ones currently on the market. Unless you'd like any of the specs much different, it's definitely worth a demo. Gotta have to like or at least get along with the Yonex head shape though. To get a better idea how this (or any other racquet) compares to what's on the market today, check out the racquet spectrum.